The Final Post and a link to the new improved version of Don's Sausage Blog. In July 2012 I started this blog. It was an experiment to explore my enthusiasm for the humble sausage. For some time I have been wanting to achieve more than the web platform provided by Blogger allows. The decision was made to morph the blog into a website. Thanks to all those readers who have visited the site.. The same reviews, musings coupled the odd inane comment will continue on the new site. To visit the new improved version of Don's Sausage Blog click here. A mate is currently in Berlin. Here is a copy of a Facebook post he made. Late last night I was introduced to an important part of Berlin culture – currywurst from a food truck. In Asian cities like Singapore, Penang and Seoul, street food is an art form. When I was a young man living in Christchurch and out drinking (and driving) on weekends, it was traditional to stop at a tiny hole in the wall burger joint in Colombo Street just north of Gloucester Street for burgers and crinkle cuts chips. 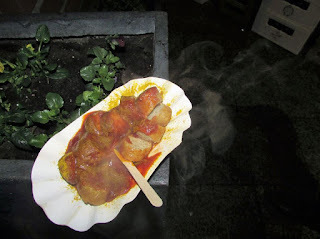 In Berlin the preferred late night post drinking nosh is currywurst. A sausage – veal or pork – is cooked and cut up with a sauce (made from tomato sauce, onion and paprika and curry powder) with a heavy handed shake of curry powder on top. I had a small taste, just to be sociable, and actually it’s not bad at all. 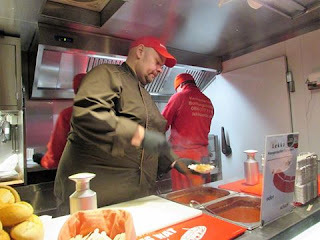 The whole business is taken so seriously that there is a currywurst museum right here in Berlin. Yesterday I completed the Tararua Mountain Race – my fourth. The route this year was from Holdsworth to Kaitoke which is usually a three day tramp. My watch measured the course at 39.26 kilometres with some decent ascent and descent to make the course interesting. I knew I was not in top form so did not push it too hard during the day and was pleased to finish in my usual, back of the field, position. It was a great day for running in the hills, no wind and not too hot. While out in the hills I encountered a hunter with the hind quarters of a deer on his shoulders. The two legs were protruding out in front of him and he was taking it slowly up the steep section of the climb from Smith’s Creek. He had shot the deer near Tutewai Hut so he had to carry it 15 kilometres to the road end. His backpack was also full of venison steaks. I said to him it must be quite an effort, and he responded with, not as tough as your day. However, I think I had the easier day. I also met two mature woman strolling along the track near the road end. They said well done as I passed them, and as I headed down the track they wolf whistled at the muddy, sluggish, tired runner, who was also carrying a few extra kilos. I wondered what their eye sight was like – perhaps I should have recommended my eye surgeon to them…. This was the first outing in the hills for my new eye. I had a cataract operation ten days before the event and the eye surgeon said I would be ok - but don’t get any dust or twigs in the eye. I thought he could have added mud and insects too. I did close the new eye in few places. There was new growth, thick and leafy kanuka near the top of the Cone Saddle and I had to push through the bushy bushes. It is great to run and have the ability to see texture on the ground - I can see the small stones and the contrast of the rooty tracks. Unfortunately the ability to see definition on the running surface was not matched by a quicker time. I think better training rather than surgery is the answer to this issue. About three hours into the event I tweaked and a bruised my ankle on some "friendly" rocks as I was boulder hopping down the Waiohine River. Ten metres further on, as I was thinking about my semi sore right ankle I hit my left foot hard on a rock. I often lose a toenail after an event but most of time you are unaware of where the impact occurs. However I knew right away that my left foot big toenail was a goner. It hurt. I walked for five minutes or so, before getting back to a run. It meant that every time I knocked it again, the tenderness of the nail was magnified. Although it was sore it was just a matter of keeping on going. Today I took a picture of my feet. It’s not pretty. My wife insists that if I ever went for a pedicure they would a) refuse to do it, or b) charge me 3x the price. At the end I was just pleased to finish and as usual I had sausages and beer waiting. The sausages were Kase-Griller from Park Avenue Quality Meats. This is a mild flavoured, smoky cheese sausage which was well received by those at the end. I would rank this sausage along with kabonosy as an excellent sausage that will appeal to all. This is as a good as it gets. This was washed down with Yakima Monster from Liberty Brewing Company. This is an APA that is easy on the palate. There is a moderate level of fruitiness and hops. At the end of a sweaty day running it achieved the necessary level of rehydration that I was seeking. Next year the route will be back to the more challenging Southern Crossing. I look forward to the pleasures of Marchant Ridge. For the rest of this series follow this link. Aussies prevail on Waitangi Day with a sweet and spicy Italian number. On Waitangi Day I headed off to the stadium to see NZ play Australia in a one day cricket match. I am always keen to see us take on the Aussies. Unfortunately, from a NZ perspective, wins against the arrogant men in yellow (or as the Australians would say, gold) are not all that common. That does mean that when NZ wins the victory is very sweet. This was the second of a three match series and NZ had comprehensively won the first game. Beware the wounded Aussie. The weather was great and we had seats on the sunny side of the stadium. Watching sport in the afternoon sun is one of life’s great delights. Although NZ batted adequately you did wonder at the innings break if they were 20-40 runs light. After an impressive opening stand by Australia the game was already in the bag, and they duly batted their way to victory. I had brought some snarlers to nibble on during the game. These were sweet and spicy Italian sausages from Cameron Harrison. These are a medium to coarse ground sausage which has good texture in the mouth. They are made of a beef and pork blend. Added to this is a complex and balanced flavour achieved by paprika, hints of pepper and a piquant of fennel. There are also other flavours that I could not distinguish. This sausage is a great eater. It achieves this by having layers of flavour that complement each other. It will not be to everyone’s liking - it does have heat, but this is not too strong. My mate said to me as he munched on a snarler - this certainly tantalises and awakens the tonsils. Another one commented that this was as hot a sausage as they would want to eat. I consider this sausage to be the best sausage I have brought from Cameron Harrison. It is similar in style to the Italian Banderia made by Westmere Butchery in Auckland. So it was an enjoyable day sitting and watching cricket on a beautiful warm Wellington day. The result was not to my liking; however this was ameliorated by consuming some very enjoyable sausages. And in the final match of the series NZ prevailed. After looking gone for all money NZ clawed back and beat the Aussies to retain the Chappell – Hadlee Trophy. Happiness reigns. Yesterday I completed the Jumbo-Holdsworth Trail Race. This is a 24km mountain run that I have completed eight or nine times previously. After having run the route in an anticlockwise direction in all the previous events, I decided to complete the race clockwise this year. The route is a short one k up the river valley before you turn left and ascend for about 7k to Powell Hut, you then continue to ascend to the summit of Mt Holdsworth at 1470m. There are a few k along the undulating ridge to Jumbo at 1405m. Then follows a descent to Jumbo Hut. There is a very steep descent down the Rain Gauge track to Atiwhakatu Hut, and then a gentle 7k down the river valley on a graded track. It all makes for an interesting Saturday morning. For a variety of reasons it was not a good day. The weather was ideal for running in the hills, not too hot, minimal wind, low cloud cover, and an occasional bit of drizzle to keep you cool. 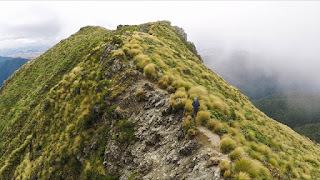 The body never really got going, mid way through the event I concluded I was not going to run a great time, so I eased off and treated it as a training run for the Tararua Mountain Race in five weeks’ time. I took forty minutes longer than I should, however I felt could easily run another ten or so k at a similar pace when I finished. Going along the ridge over the tops the cloud parted to give views into the upper Waiohine Valley. This is impressive rugged bush country, it is what being in the hills is all about. It makes you feel great to be alive. 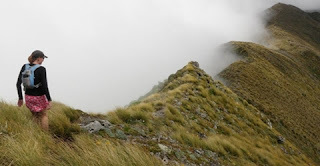 The photos on this post are all taken from the net, the image of the cloud shot was similar to the cloud that hung from the top of the ridge and went deep into the Atiwhakatu Valley. The organisers of this event do a really good job, the event has a very nice feel, it is organised by people who do it for the good the mountain running community, it is not a corporate money making event. They always put on a good feed, with a barbecue at the end. A great way to refuel the body. I had bought additional beer and sausages for the finish. For the later section of the event I felt like was going to be sick. Any food I put into my stomach from the barbecue was going to grace the grass shortly afterwards. I realised that I should eat something, so I consumed two oranges. I had brought sausages – lamb merquez from Park Avenue Quality Meats and an IPA The Vandal from Panhead Brewery in Upper Hutt. These were not consumed and went home untouched. So there was no beer or sausages. However in the circumstances this was the best for all concerned. I do know that at the next event, the Tararua Mountain Race, in five weeks’ time that beer and sausages will be present and they will be gratefully consumed at the end of a hard day in the hills. For other parts of this series, click here. This is the final post from summertime Raglan - it was an enjoyable two weeks of sun and relaxation. The surf at the beach in the second week was a bit lumpy and uneven, however it was still vastly better than being in Wellington. I have a gps watch that I use for running, this watch has an open water swim function. Using this while boggie boarding it was able to tell me that I was surfing the waves at 29 seconds per hundred metres, this is considerably quicker than the world record for swimming a hundred metres which currently stands at 46.91 seconds. I do like the speed and power of the surf. After another day at the beach we had snarlers for dinner. These were canela chorizo from Zamora in Queenstown. These are a medium to coarse ground sausage, cinnamon is the primary flavour. Of all the sausages I have sampled from Zamora this is one I liked the least, I guess I’m just not a fan of cinnamon. I had managed to perk some snapper and a couple of flounder, these were cooked up on the barbecue along with the snarlers for dinner, we also had aubergine smash, a chick pea salad, and roast spuds. I did not do the best job of cooking the fish on the barbecue, the flounder was alright, however the snapper fillets came apart. I definitely more practice needed in the art of cooking fish on the barbie. As this is the last post I must make comment about the great little butcher’s shop in Raglan. I consider Top Cut Butchers punches above its weight in the fine art of sausage making. Although I have been discursive about a couple of the sausages they have made, they make a wide variety of quality sausages tailored to the kiwi palate. If you are in Raglan I would recommend you pop in a grab a few snarlers for dinner. My favourite was the sweet chilli and plum, the only way you can identify your preferred sausage is the try them. I hope to return to Raglan next summer to spend more time enjoying the ambiance of the place, with a special focus on the beach, and of course sausages on the barbie. Over the next few weeks I will be competing in the Jumbo-Holdsworth Race. I see this as a warm up for the Tararua Mountain Race held five weeks later. As part of my training I decided to go to the top of Karioi mountain near Raglan. This is an old volcano that is close to the coast and stands dominant in the Raglan landscape at 756 metres above sea level. The route I took was up the Te Toto Gorge. This route follows the ridge on the true left of the gorge. It is not subtle, in fact it just goes straight up - deviations to make the route easier are not part of this track. There are even a couple of ladders provided to get over small rocky bluffs. In a number of spots chains are anchored into the rock, these assist the ascent and descent over a few precipitous points. The route follows the only place in the North Island where bush cover runs from the coast to peak. This bush is not majestic and the trees are not particularly large, maybe three to four metres high, however I was traveling up the ridge and I assume the exposure to the weather stunts the growth of the trees. The track is extremely rugged and gnarly, as I was travelling alone I did not push it too hard as it would be easy to do an ankle over the uneven terrain. When I reached the summit the view to Raglan Harbour to the north and Aotea Harbour to the south was well worth the effort of getting to the top. On a rock at the summit; surprise, surprise I found two sausages. Who would have thought? After tasting, and due consideration, I determined one of them was my favourite, chorizo criollo from Park Ave Quality Meats in Lower Hutt. I often mention this snarler and I still consider it is the best sausage available in Wellington. The other snarler was a Spanish chorizo from Top Cut Butchers in Raglan. This chorizo lacks complexity and balance in comparison - it is just hot flavour, too much chilli, pimenton or smoked paprika that dominates the sausage, a quality chorizo has balance with other flavours also present, I was not keen on this snarler. On the way down you there were great vantage points looking into the gorge. You could see good bush and even a small flock of keruru or wood pigeons flying down the gorge. From above they did not look like the slow flying lumbering fat birds you see from the ground level when they take off from trees, they gracefully glided down the gorge. We took a day trip to Kawhia. I had never been there before so we visited Ocean Beach, just to the north of the harbour. On the beach there were a pair of NZ dotterels nesting, signs identified them and their nest site was cordoned off by stakes and rope. Dotterels are endangered, there are less dotterels that there are kiwis. About twenty birds live south of Auckland, so it was a privilege to see this bird and their distinctive run across the sand. Below is a photo of one of the pair. For other blog posts about being the hills, see this index.